For some reason I thought the name of this polow was Estamboli Polow. But when we were looking through Madam Montazemi’s cookbook we discovered that it’s spelled in a different way. I should clarify who “we” is by the way, it’s my mom and me!!! My mom flew in a couple of weeks ago and things have been rather busy around here. A couple of the readers had requested Estamboli Polow or Eslamboli Polow so my mom and I got talkin’ about the method of preparation. She told me that Madam Montazemi suggests soaking the rice in tomato juice and then cooking it in the same juice. We went to work and followed her cooking method and the result was one hell of a disappointment, through and through! It was so bad that I threw away most of the rice. Not to be the ones to give up, we went at it again yesterday cooking the rice in the traditional polow manner, and my what a difference. YUMMY!!! I personally chose to use fresh tomatoes when making this dish. You can easily substitute the tomatoes with canned ones. With this said, you will get hell of a lot more flavor from fresh tomatoes that taste good! If using fresh tomatoes then you must remove the skin. Please see the post How to Peel Tomatoes to learn how to remove tomato skins. Small dice onion and mince garlic. Saute in olive oil until translucent. 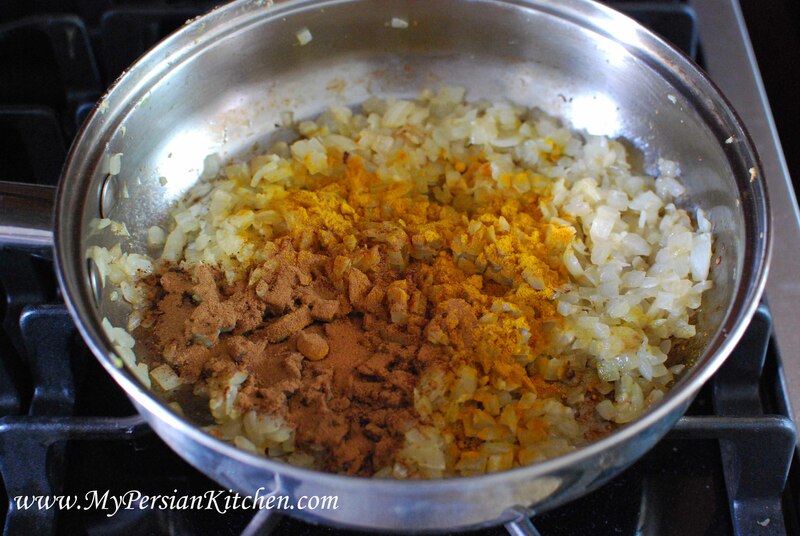 Add 1 tsp of turmeric and two tsp cinnamon. Small dice meat and add to the pan. Pan fry until browned. 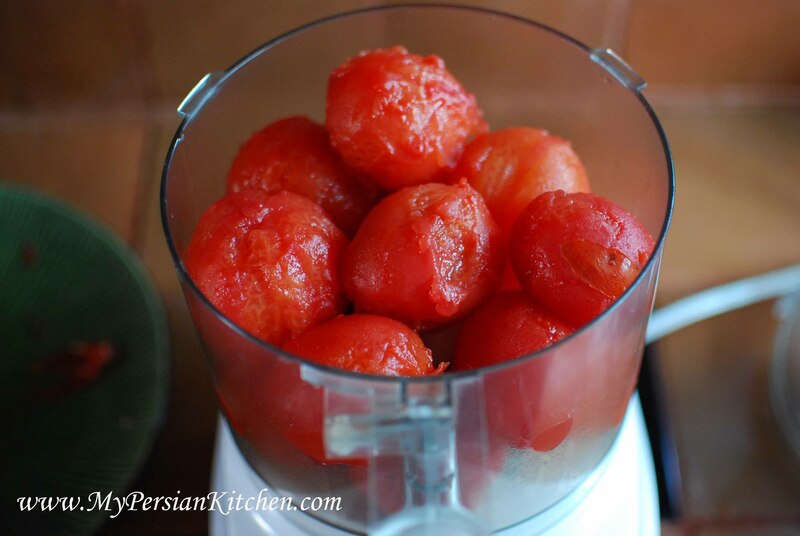 Place tomatoes in a food processor and puree. 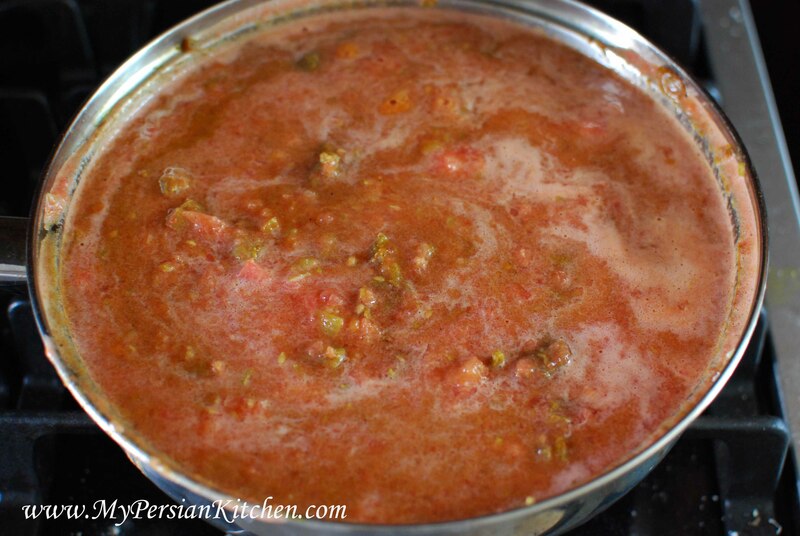 Add 1 tbsp of tomato paste to browned meat. Add pureed tomatoes, season with salt and pepper. Cover and cook for 30 minutes. Remove cover and further cook for another 30 minutes. In the mean time cook rice according to the post Cooking Rice for Polow. I did something different this time. Here is a little Persian Cuisine tip for you!!! Add 1/2 to 1 teaspoon of turmeric to the rice’s water. It will turn the rice into a gorgeous yellow color. You can use this trick when making rice that will be mixed with tomatoes such as this one and Lubia Polow! My my my!!! Look at the color of this rice! 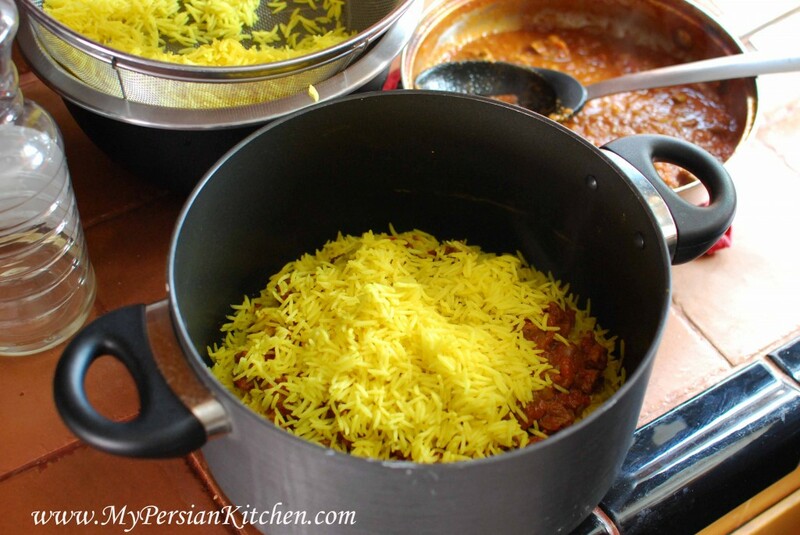 It’s up to you what type of tahdig you want to make. 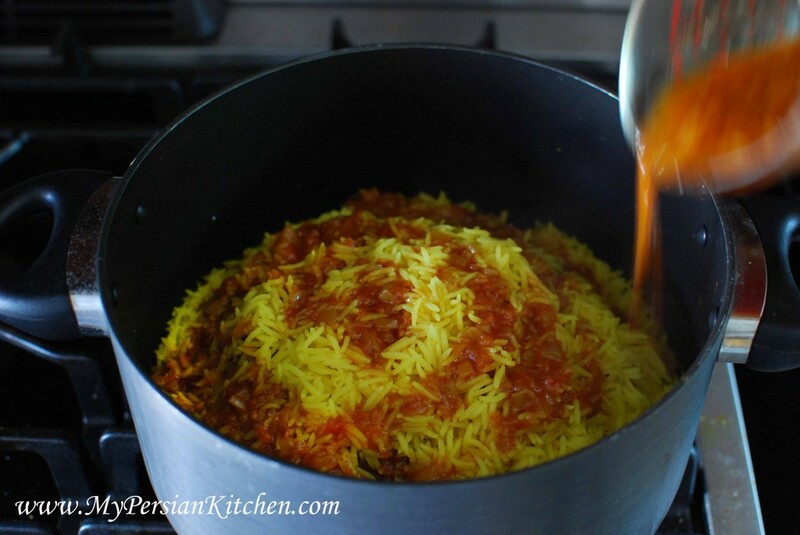 Add oil and water as usual to the bottom of your pot and built the rice layers as usual. Add a bit of the meat and tomato stew. Then some more stew until all the meat is gone. Make sure that too much juice is not mixed with the rice. Finish with a layer of rice. It’s so nice to have a little assistant to help me out in the kitchen!!! Makes picture taking so much easier having someone who helps!!!!!!!!!!!! Cover rice and cook on high for 10 minutes. 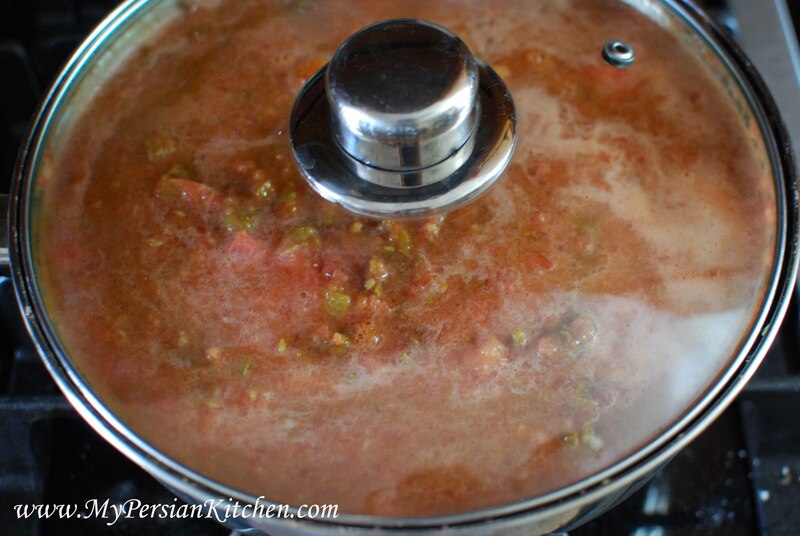 Take 1/2 cup of stew juice, 1/4 cup water, and 1/4 cup oil and mix together. Gently pour over the rice. 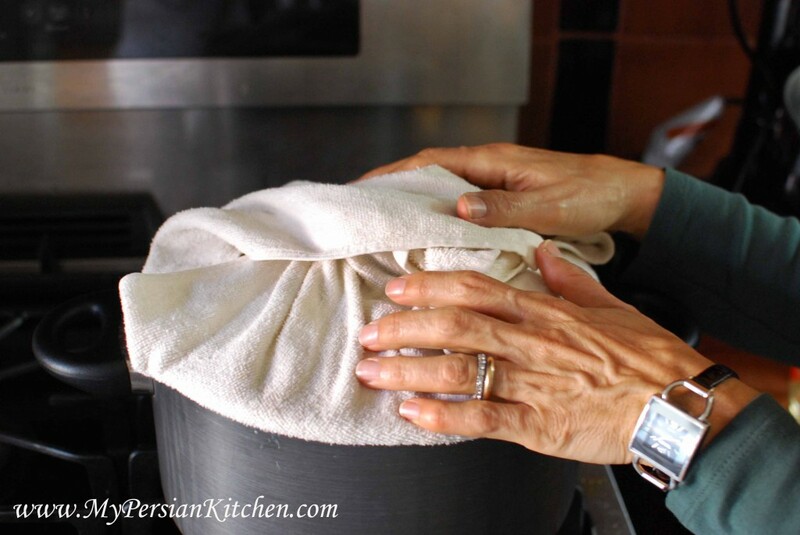 Place the lid in a towel and then put it back on the pot and cook on low for one hour. 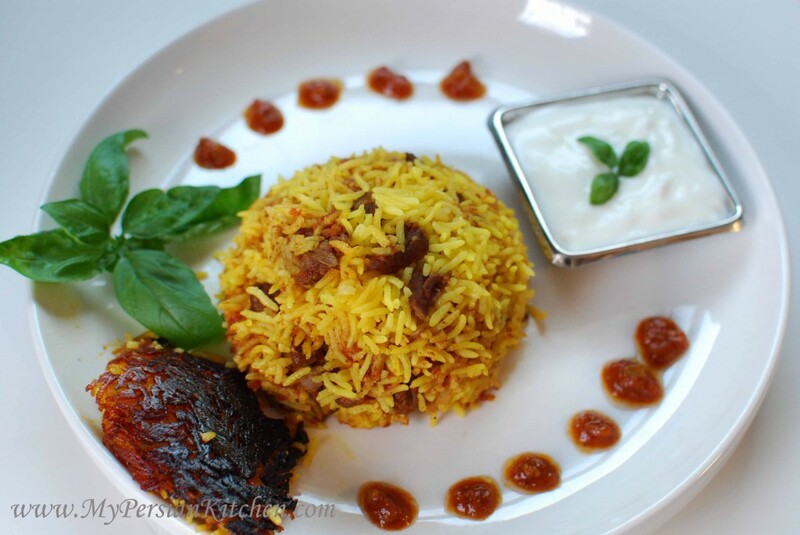 Serve this rice with plain yogurt, Mast-o-khiar (yogurt and cucumber dip) and/or Persian herbs. 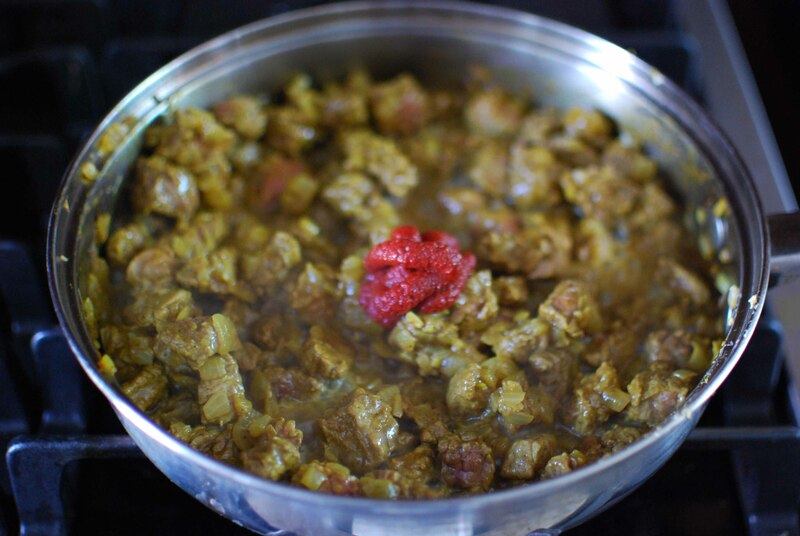 Interesting to hear that Madam M’s recipe was not successful, I’ve heard so much about her book but never had a chance to read it or try any of her recipes, and btw I’ve never heard of “Islam”boloi…I always thought it was Istamboli too. Thanks for yet another great recipe and enjoy your Mom’s company…they are the greates!!! My husband and I make this quite differently. 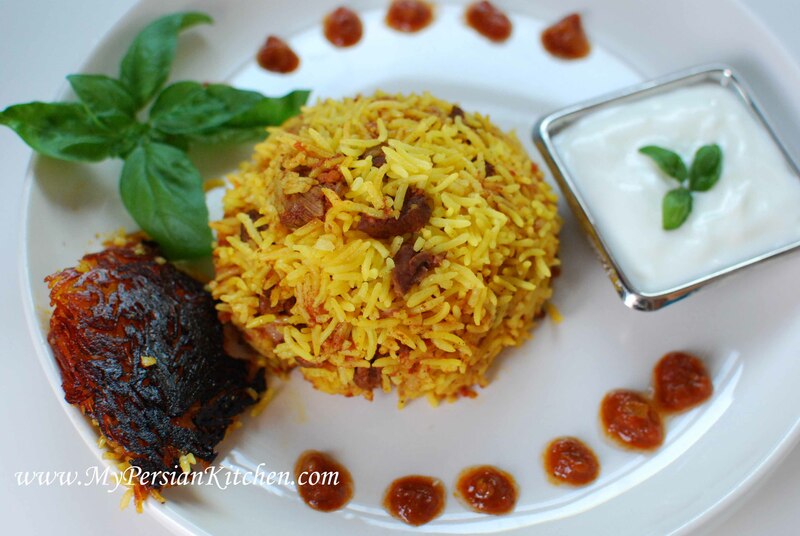 First of all, we call it Istanboli Polow (or Turkish Rice). We cook the rice in the tomato sauce. 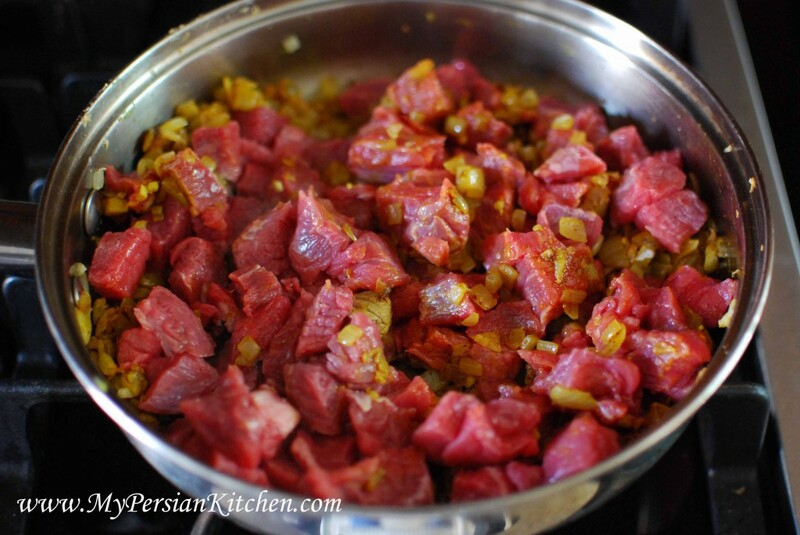 When it is done we add meat (could be lamb, beef or chicken), chunks of carrot and green beans and slivered almonds. Then, instead of steaming like traditional polow, we bake it in the oven until the crust is nice and brown. It should turn out onto a platter like a cake. We love it. 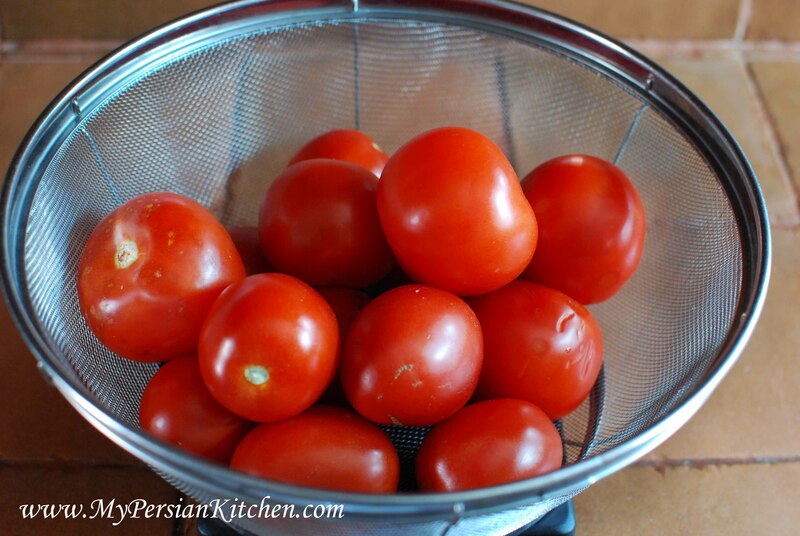 Estamboli Polow is a wonderful dish to prepare when your garden has over produced tomatos. This is a fall favorite for my family! @ Birdette, It was sooo soo good!! My mom and I thought that the reason why the first try came out bad it was the amount of water that the recipe said to add to the rice. It came out all mooshy, Agh, it was so bad!! @ Susan, now this is interesting I had never heard of carrots, green beans, and slivered almonds. I am going to try to make this rice again by cooking it in tomato juice like I did the first time. But this time I am not going to add extra water. This looks absolutely divine!! I have been perusing your website to find recipes to make for my dad when I go home for winter break from college and this is definitely a keeper. This summer I used your recipe to make ash reshte (definitely not a summer food, especially a Texas summer, but it’s my favorite!!) and it turned out heavenly, thank you! Your recipes are very thorough, easy to follow, and fool proof for us culinarily-inept out there. This dish looks fabulous. Love how you copped to the massive failure the first try of this dish was. 😉 Bummer that that seemingly simplified method didn’t fly. That’s awesome that you have your mom there with you to cook with youm through failures and triumphs. Such wonderful bonding time. Bria, yes, I always like to share the process cause I think that one can only learn from failure. It’s been fun cooking with my mom! Hi sanam i,m from iran .thank,s for you,r wonderful website. i have e private message and a suggestion for you. can i have you,r Email address? Somayeh, my email address is listed under the Contact tab. I eat this food one time a week in the restaurant of my university(tarbiyat modarres university in tehran). the chef of my university add some small cubed fried potato to this recipe. Love your page. Do you ever do cooking classes in Arizona? 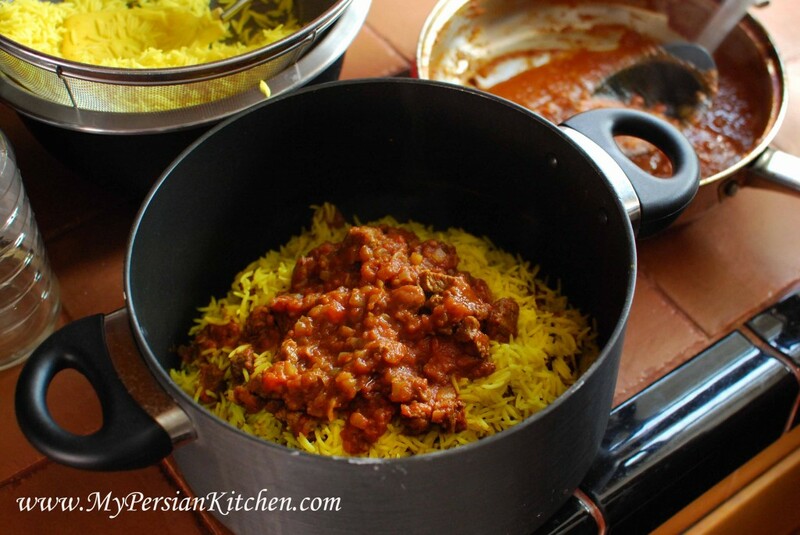 I’m really interested in classes in Persian cooking but don’t know where to start. Danienne, I am willing to travel to other states and cities to teach so long as someone who lives locally can help me find a place where I can teach cooking as well as help me recruit other folks interested in taking the class. Our dress maker used to grill green chilies over gas flame, peel the skin and dip the peppers in vinegar, a quick and great “torchi” she served with estanboli pollow, yum! Danienne, I will send you an email right now!! 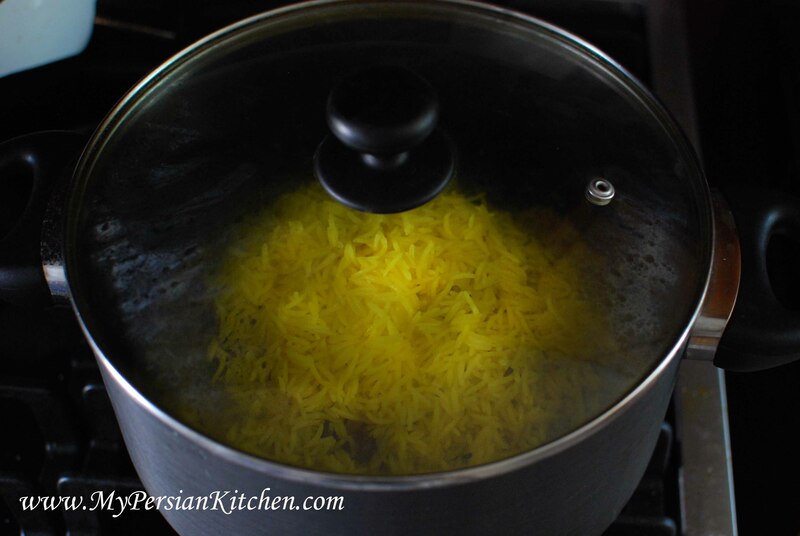 It is also one of my favorite iranian foods, unfortunately I rarely find the time to make it. Although I bet I could come up with a quickie version…. 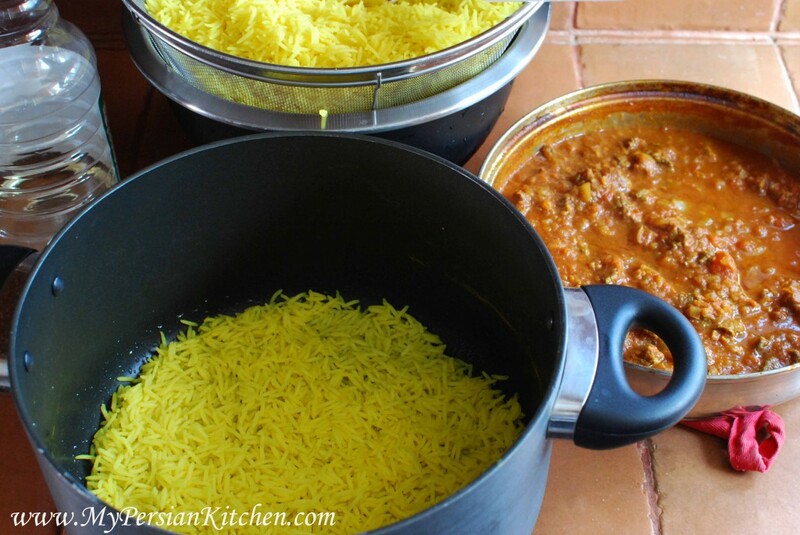 I should create my own blog titled “My tiny persian kitchen” with shortcuts of every meal, and how to make them with very limited pots and pans!! I just wanted to thank you so much for creating such a website, because of you i feel comfortable to invite my family and in-laws over for dinners; as we are all persian. My mother always did the cooking and she doesnt do any measuring, so when i got married it was very difficult for me to understand exactly what and how much of ingredients to use. so THANK YOU from the bottom of my heart! 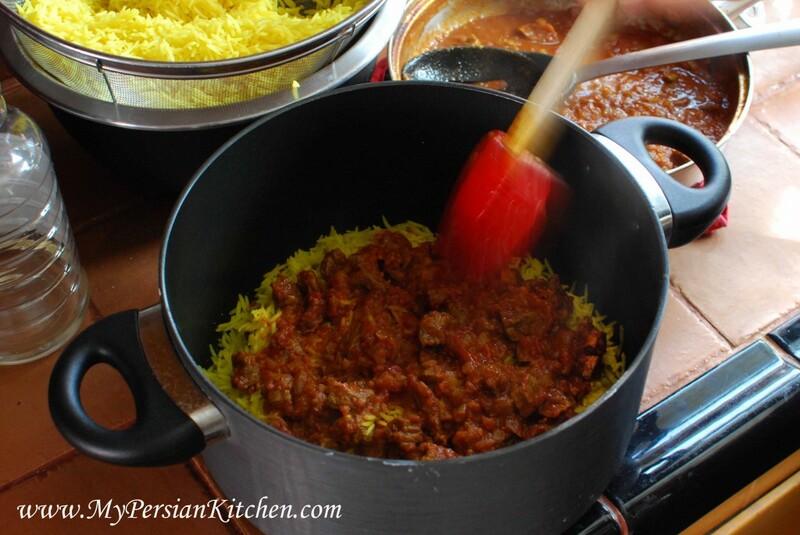 I look at a lot of different websites for Persian recipes. 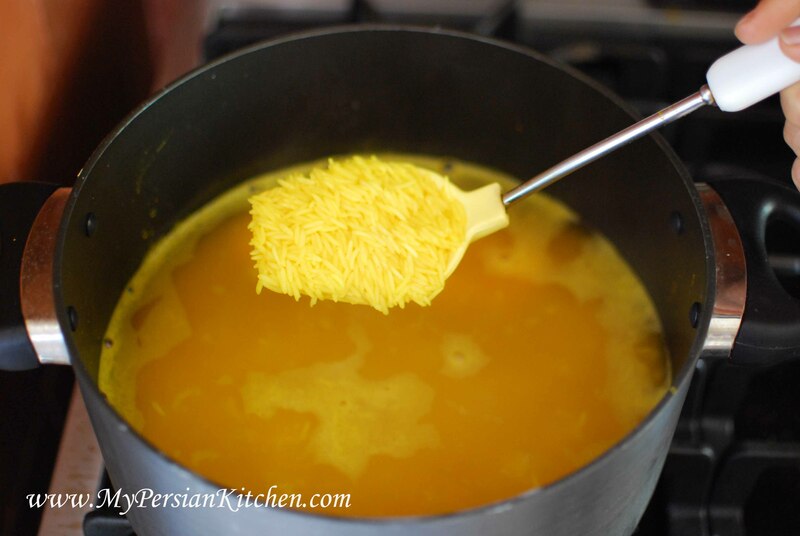 As it relates to the name of this dish, on another website: Turmeric & Saffron, the blogger says “with the addition of small cubed potatoes using the long and narrow type of potato called estamboli in Iran.” It sounds like “estamboli” is a type of potato. I don’t know but perhaps this may shed some light on the name. Back in the day in Iran, a lot of woman did not write a lot and many things were passed down verbally. I think this could cause differences in names. I love to make this dish but I usually add a lot more tomato types of stuff: canned tomatoes, tomato sauce and tomato paste. 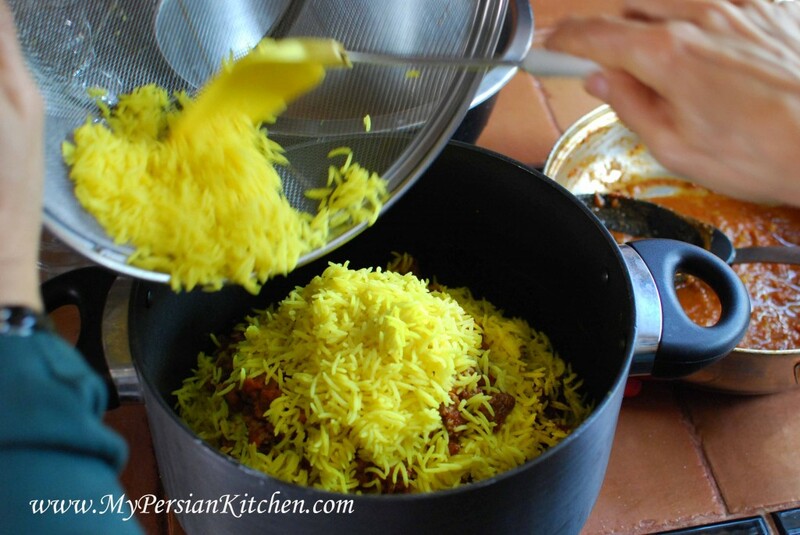 It is important to not over parboil the rice if you add a lot of wet ingredients. I also add some saffron now and then depending on my mood.